Home » Posts tagged "Sewing Defects Solving Process"
Reducing sewing defect is the key task for garments quality management and it is one of the challenging jobs. This article is all about solving sewing defects/faults. 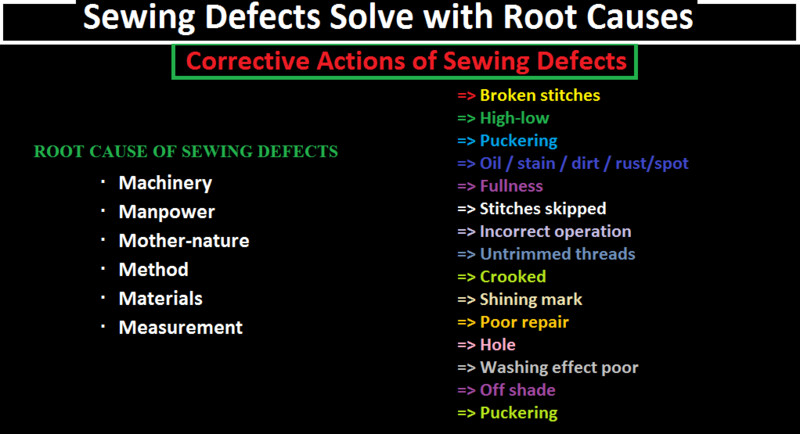 Here I have listed total 15 defects of garments, root causes and corrective action to reduce them. 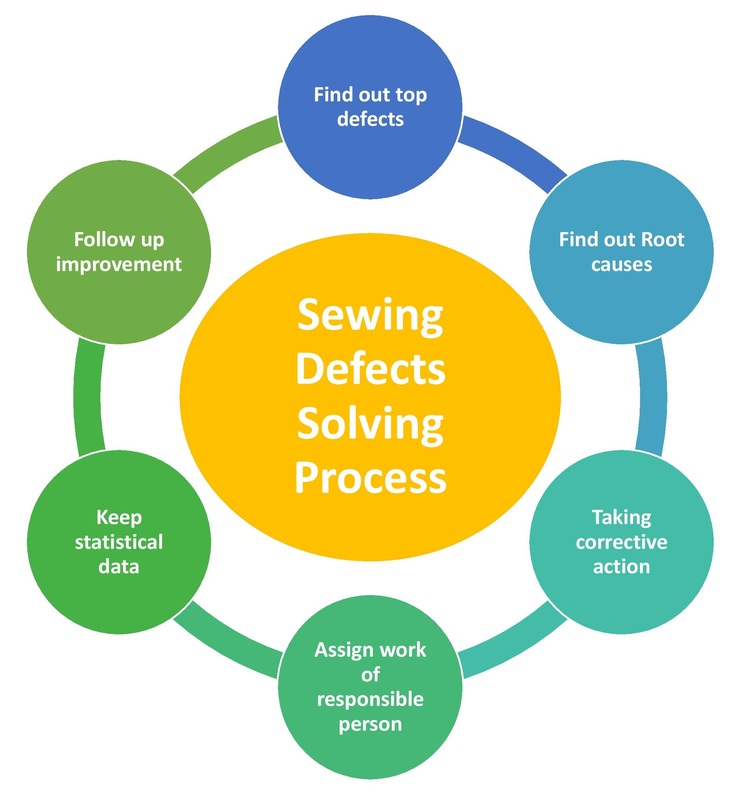 After reading this article hopefully, you will be able to know how it is possible to reduce Sewing Defects Solve with Root Causes. In a sewing defects solving process you may commonly find the following process. This one is a continuous process where you need to follow to solve your sewing defects problem in a garments industry. Corrective action is to solve or correct the problem which considers as a defect. Action should be specific and work should be divided to related responsible person. This is a very effective way to solve defects. In this article, I gave corrective action against each and every defect those normally visible. Total fifteen defects are there and for these defects what are the root cause and how we can minimize these problems are also given below in a chart. 2. Poor thread quality 2. Take initiative to ask the supplier for a better quality thread. 3. The wrong thread size 3. Machine maintenance team have to check every machine speed routine wise. 2 HIGH / LOW 1. Operator negligence 1. Train up sewing operator for stitching incorrect seam point. 2. Marking up down 2. Marking to marked correctly, sewing supervisor is responsible for it. 3. Incorrect cut mark 3. Correct cut mark and proper use of sewing guide will be ensured. 6 INCORRECT OPERATION 1. Inefficient operator. Not following the approved sample 1. Proper education and counseling of Supervisor to each and every operator during the start of any operation. Ensure that stitching should follow the approved reference sample. 2. Operator not checking his own work before passing to next process 2. The supervisor should advise the operator to do self-inspection. In line, QC should check on this and make a record on those operators not doing self-inspection to check their performance. 4. Negligence of Supervisor and they do not check the work of the operator. 4. Sewing QA in-charge and supervisor with coordination with GPQ team should ensure that all any operations are confirmed before bulk production to avoid any mistake. 5. In line QC not doing proper checking per operation during the in-line audit. 5. In line, QC should strictly follow the procedure of inspection. 6. Machine not properly adjusted 6. Ensure that mechanic adjust properly the machines before bulk production. 7 OIL STAIN/ DIRT/RUST 1. Poor housekeeping and handling of garments. 1. Maintain good housekeeping in the working area. Sewing & Finishing In Charge should ensure their working place is in order, neat and clean. 2. Some machines with oil leakage 2. Educate and train quality inspector for the proper inspection method. 3. Lacking proper machine maintenance 3. Maintenance department should ensure that every machine will have a maintenance checkup once a week. Ensure proper oiling level to be maintained to prevent leaking of machine oil. 4. Dirty workplace 4. Application of scrap paper under the presser foot of sewing machines after the day’s work so that machines will oil leakage can be traced. 2. Not maintain the proper sewing procedure 2. Motivation and training of Quality Inspector on proper work behavior. Ensure that proper method of inspection is being followed all the time. GPQ and QAD In charge should conduct an audit every hour to check the quality. If You like this article then please do not forget to give your valuable feedback.